As with the rest of our site, this page will continue to evolve to include more details about our Red Warrior POWs. A brief history at the bottom of this page provides rudimentary information about the events that led to their capture. It was read before the attendees of the 2008 reunion prior to honoring the Former POWs. It is but a brief extract of the detailed battle report written by Roger Hill. PFC's Van Bendegom and Schiele died in captivity. Schiels's remains have never been recovered and are still classified as MIA. Jim VanBendegom Remains were identifeid in 2014. The remaining five POWs were released in March of 1973. 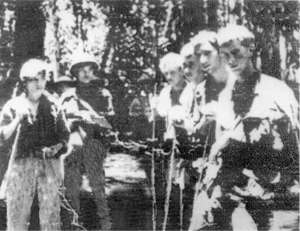 This grainy picture is the only one known to exist of four of the seven Red Warriors shortly after their capture on 12 July 1967. They are shown tied with a rope around their necks and led by a female NVA Soldier. PFC Stanley A. Newell (details) Read his report of his POW experience and lessons learned. Go To Our MAP PAGE. Map 6536-III shows location of battle where POW's were taken. For additional detail you may wish to obtain the comprehensive "Battle Report" compiled by Roger Hill and available from our PX page. L-R: Former POWs Cordine McMurray, Nathan Henry and Richard Perricone surround Virginia Vanbendegom. Virginia Vanbendegom of Kenosha, Wisconsin, attended the 2008 reunion which honored the former Red Warrior POWs, and her son James Vanbendegom, who is still listed as MIA, although it is known that James Vanbendegom died of his wounds shortly after being captured with McMurray, Henry, and Perricone on July12, 1967. 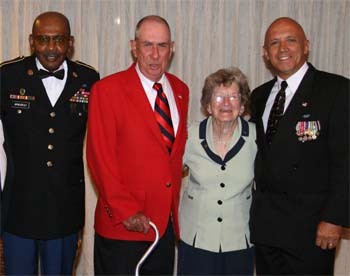 The 2008 reunion honored the former POWs and their families during the final evening banquet. Red Warriors Lewis Easterly, left, and former POW Stanley Newell. 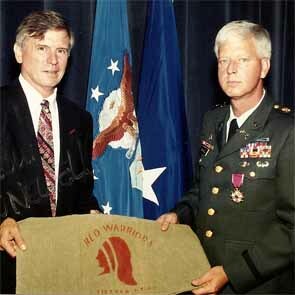 Left: Lewis Easterly presents LTC Newell, who was a PFC when captured, an actual sandbag that he brought back from Vietnam. The occasion was the August 31, 1994 military retirement of Newell. He and former POW Cordine McMurray made the military their career after their release. Below: Comment taken from our Guest Book: posted by Liz Willis Soldwedel in 2010. In early July 1967, elements of the 66th and 88th North Vietnamese Army Regiments (NVA), whose sanctuaries were in Cambodian territory, begin noticeable activity across the border into the Central Highlands of South Vietnam. They focus their concentration at the northern end of the Ia Drang Valley, Pleiku Province. Fourth Division monitors their movement through radio intercepts, actual sightings, and electronic sensors. Everything indicates that the NVA are grouping… and up to something. American forces’ response… call in the B-52s. After all B-52 strikes, it is SOP for American troops to be sent back through the strike area in order to conduct a “Bomb Damage Assessment.” Its purpose, of course, is to determine if the air strikes are effective. What we didn't know until much later was that the NVA had figured out this simple tactic and strategy. This July… this July in 1967, they would purposely make a showing… and knowing that it would take 1 to 2 days for a B-52 strike to occur, would quietly slip back into Cambodia before the air strikes rained down their horrific power. After the air strikes, the NVA plan to rush back into the area, wait for the American sweeps to take place… and then spring their trap… Their goal… to wipe out an entire American Army infantry unit. And so, during the few days before July 12, 1967, the NVA enact their plan… It is a perfect scenario… to spring a trap. On the morning of July 12, Charlie and Bravo Companies from our battalion have the mission of conducting the Bomb Damage Assessment sweeps. Both companies are under-strength. Instead of about 120 personnel, Bravo Company has 69 men in the field; Charlie Company, about 75. It had rained during the night… the morning brings a heavy damp mist. Aircraft are grounded until the weather improves… and both companies are told to remain in place and simply conduct security sweeps around their perimeters. Charlie Company is 1000 meters to the north of Bravo, and both are 6000 meters from the Cambodian border. Charlie Company is the first to send out a patrol. It’s their 2nd Platoon. They first venture west of their perimeter, then swing south in the direction of Bravo Company. As they do so, they suddenly make contact with twelve NVA, killing three of them. Battalion is alerted. They, in turn, alert Bravo Company and instruct them to establish radio contact with the 2nd Platoon of C Company. It is now 0845 hours. A Charlie Company observation post sights 30 NVA moving west of their position, moving to the northwest. No action is taken, but by this time everyone’s nerves are getting on edge. At the same time this is happening, Bravo Company, under the command of Captain Brian Rushton, sends out their first security sweep. 1st Platoon has the mission.. Ten minutes later they report NVA moving to the south of the perimeter… No contact is made and 1st Platoon closes back into their company perimeter. 3rd Platoon, under the command of Lieutenant Gaylord Nootz and his Platoon Sergeant, Cordine McMurray, now depart with the task of sweeping the west side of Bravo’s perimeter. It is now 0920 hours. Charlie Company suddenly reports enemy movement to their north and directs mortar fire at the area. Twenty minutes later, Captain Rushton of Bravo Company orders his 3rd Platoon to break off their perimeter sweep and head northward to link up with C Company’s 1st Platoon. 3rd Platoon leader Nootz is told to change radio frequencies to Charlie Company and to communicate with them directly. In essence, he’s now under Charlie Company operational command. In less than two hours, Charlie Company has briefly engaged the NVA just South of their perimeter, killing three. They have seen 30 NVA to their West. And to their North, they are lobbing mortar rounds at enemy movement. Bravo Company’s 3rd Platoon is headed northward to link up with Charlie Company’s 1st Platoon, which is still on their original sweep and pinned down. The day is not looking good. Back at Bravo Company’s perimeter, all is quiet but Captain Rushton and his RTO, PFC Nathan Henry, are closely monitoring battalion and Charlie Company radio traffic. Weather has improved and the Battalion Commander, LTC Corey Wright, finally is airborne and departs for the battle area. Four minutes later, at 1056 hours, the NVA begin to close their trap. Charlie Company’s 1st Platoon and Bravo Company’s 3rd Platoon are suddenly under attack. Heavy attack! LTC Wright immediately orders both Charlie and Bravo Companies to move out and link up with their embattled platoons. Bravo’s commander, CPT Rushton, gives the order to move out. Weapons Platoon will stay behind to provide mortar support... But they only have 41 rounds. Lieutenant Roger Howse, who has been in country for only a few weeks, leads the way northward with his 1st Platoon. Lieutenant Gary Rasser follows with his 2nd Platoon. The CO, RTO, senior medic, and a Weapons Platoon Forward Observer follow. Also in the latter group are four engineers from the 4th Engineers, and a three-man Forward Observer team from the 4/42nd Artillery. Shortly after they leave the perimeter, enemy forces are sighted south and southwest of their location, and artillery and mortar fire from battalion are brought in against this force. The time is 1108 hours. Things now begin to happen quickly. LT Nootz’s 3rd Platoon comes under a major assault from the west and southwest. Realizing he’s in trouble, Nootz re-establishes radio contact with his own commander, Caption Rushton, and requests immediate help. Rushton responds they are coming as fast as they can. Artillery fire is redirected so that 1st and 2nd Platoons can link up with 3rd Platoon. The embattled 3rd Platoon is now under enemy mortar fire… each blast coming closer and becoming more and more effective. They need help now! Ammo is just about gone. 1st and 2nd Platoons continue to rush forward… and walk into waiting NVA gun sights. Using the 3rd Platoon as bait, the main force of the NVA have been patiently waiting for the 1st and 2nd Platoons. 1st Platoon is the first to engage the enemy. They shift to the right so that 2nd Platoon can come along side, but things will not go well. 2nd Platoon is several minutes behind them… Help won’t come immediately. There is intense fire, so loud it drowns out everything but shouting. 1st Platoon Leader LT Howse is hit in the leg. Medic John Stroud comes to his aid. Howse realizes he must withdraw, and gives orders to his men to break contact. With a few of his men and medic Stroud, Howse makes it back to the company patrol base. Stroud goes back into the contact area and repeatedly rescues more men. While this is unfolding, 2nd Platoon is faring no better. As they approach the west side of the 1st Platoon, they walk into a wall of enemy fire. Losses mount quickly and LT Rasser comes to the same conclusion as LT Howse... break contact and fall back. But his way back is now blocked by the enemy. He and his remaining men begin an escape and evasion maneuver that is miraculous and he manages to get the few survivors of his tattered platoon past 3 lines of enemy troops. Since the very first engagement of 1st and 2nd Platoons, Captain Rushton knows he must move forward with his command group. But he doesn't realize that the NVA have now assaulted the entire company. Enemy 82mm mortars begin to rain down the entire length of the company line. 24 minutes later, the chopper is hit by a volley of small arms fire. The pilot is severely wounded but LT Jennings, who has never flown an aircraft before in his life, grabs the controls and manages to fly the chopper away and land safely. While all this is going on, 3rd platoon is quickly whittled down to but a few men. They are out of ammo… The dead and wounded are scattered throughout the small defensive position. Platoon SGT Cordine McMurray urges those who are left to fight to the very end. But with no ammo left, the end comes soon enough. SGT McMurray is brought down and taken captive. Some meters away wounded SP4 Marty Frank and PFC Stanley Newell are found by the enemy and taken prisoner as well. 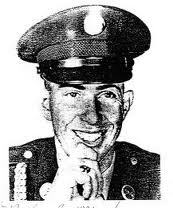 PFC Richard Perricone remembers resisting hard and fighting hand to hand with his enemy, but eventually also ends up a prisoner. Perricone vividly remembers the enemy looking for other wounded Americans to take as prisoners. Now with his arms bound, Perricone is brought to one of his wounded buddies alive, but in bad shape… and is forced to watch as he is executed with a single shot to the head. Bravo’s Headquarters Platoon no longer exists… RTO Henry now believes he’s the only one alive in the command group. He doesn't’t know what’s happening with 1st, 2nd or 3rd Platoons. Mortars are landing around him... Things go black. The next thing Henry remembers is waking up. His hands and feet are bound. He’s suspended from a pole and being carried away by two female NVA soldiers. Charlie Company reports to battalion that their 2nd Platoon has re-entered their perimeter; they are no longer engaged with the enemy. LTC Wright orders Charlie Company to go to the aid of Bravo Company, but as they do so, the NVA again engage contact, and their progress is slowed. Little do they know that at this very moment, the NVA are policing the battlefield of Bravo Company. The NVA recover their own dead and wounded, pick up Bravo Company’s weapons and equipment, and triage Bravo Company wounded who may be fit enough to be taken prisoner. Those who are too badly wounded... are executed with a shot to the head. The jungle is quiet. Charlie Company reports that all enemy contact has been broken. There are no more shots being fired… There is no radio contact with anyone in Bravo Company. In just over an hour-and-a-half, elements of the 7th Battalion, 66th NVA regiment, have all but destroyed Bravo Company. Third platoon is wiped out. The NVA are headed back to Cambodia. With them are seven American soldiers, seven of our own Red Warriors. All are wounded, some more seriously than others. But as hellish as the past hours have been, their ordeal is just beginning. Some have have six more years of harsh captivity. Others didn't’t make it. Captured from 2nd Platoon is PFC James Van Bendegom. He reportedly dies from his wounds at an NVA field hospital in Cambodia a short time after his capture. Also from 2nd Platoon is SP4 James Schiele. Later NVA reports reveal that he died on his way to their field hospital and he was buried along a trail. From the headquarters platoon, Company RTO PFC Nathan Henry survived his imprisonment. SP4 Martin Frank, who survived his imprisonment, but, who sadly, passed away about 3 months ago. These men were held in North Vietnamese captivity from July 12, 1967, until their release in March of 1973, nearly six long years later. Only they know the brutality and deprivation they endured. Read by Jim Daniels, Sept. 2008 - St. Louis Red Warriors Reunion. Condensed from the detailed Battle Report written by Roger Hill. I was a member of Co. B. 1st Bn. 12th Infantry 4th Infantry Division. I was captured on July 12th 1967 and spent a little over two years in the jungles of Cambodia. Then I moved to North Vietnam where I stayed until March 5,1973, the day I was released. I was captured about 25 miles west of Pleiku City, with four other Americans. When we reached the first jungle camp in Cambodia we met two other American POWs. We all tried to escape from there November 6, 1967, but failed and were recaptured. around all day. Then at 4, we would have our second meal. Then, at about 5:30 or 6, we would be locked up again for the night. Some life, don't you think??? We were allowed to bathe about once a week or ten days. This mostly depended upon which guard was on duty that day. By Catherine Hunter - July 2007 Franklin, N.C.
“We didn't know if we were going to be killed or what,” said Franklin resident Nathan Henry (third from right). Henry is shown with other wounded soldiers Marty Frank, Richard Perricone and Stan Newel who were captured by North Vietnamese soldiers during the Vietnam War. They survived the Hanoi Hilton. They spent six months in stocks 24 hours a day and lived five men in a ten-by-ten-foot room. Today, 40 years later, Nathan Henry of Franklin and Cordine McMurray of Detroit, Mich., look back, remember and even laugh. Henry and McMurray are two of 14 U.S. Army Vietnam War POWs who are gathering in Franklin for a reunion this weekend hosted by Henry and his wife, Becky Henry. It’s a chance for the men to get together, tell stories and remember. “They’re [Vietnam POWs] dying like flies. Especially the pilots,” said Henry. “There used to be around 600 [POWs]. Now 150 to 200 have died,” he said. McMurray drove down from Michigan this past Sunday to visit with the Henrys for a few days and attend the reunion. McMurray and Henry were constantly together during their six years of captivity and were held captive longer than any of the other 14 POWs from their Company. Henry had just turned 20 and McMurray was 27 when they were captured. As members of B Company 1st Battalion 12th Infantry Division, McMurray and Henry were sent out on patrol from their base camp in Pleiku with their Company to find some North Vietnamese who had attacked another U.S. Infantry Company. “We got the call on the radio to move to another designated place and sit there for about four hours,” said McMurray. He said they ran into another Vietnamese rifle company on the way to the designated location. According to Henry and McMurray, five men, including themselves, were captured that day in the Ida- Drang Valley on July 12, 1967. Four of the five men were shot and Henry had shrapnel wounds in both his ankles and his shoulder. “The red-haired guy from Minnesota ...,” McMurray added. “I can’t remember his name. He was shot up pretty bad — gut shot. I think he died about two days later. They weren’t going to feed him.” McMurray still gets letters from the red-haired boy’s family. The men spent the night in a fox hole and then were taken underground for two to three days, where they received medical care for their wounds. “Of course it wasn’t very good,” said Henry. McMurray said if his leg wound had been any worse he would have lost his leg. I didn’t know I'd been hit in the leg until I was walking in the water. Oh! It burned!” he said. McMurray was also shot in the right shoulder and had a bullet glance off the right side of his face. Six years later, in January of 1973, they got word of the peace treaty being signed. It was March 5, 1973, before McMurray and Henry were released. Henry said they had to bow to the guards and sometimes sweep the courtyard. McMurray remembered having to move a pile of bricks from one end of the compound to the other, then having to move the bricks again the next day. “And what do you think he saw ...,” finished McMurray with a big smile. The men didn’t talk much about the physical hardships they endured. Henry did mention walking for 48 days through Cambodia and Laos to arrive in the Hanoi Hilton on Christmas Day in 1969. Neither Henry nor McMurray suffered the famous “bamboo cage” in which many POWs were confined. “The bamboo cages were about this big,” said Franklin Resident Nathan Henry (left). Fourteen Vietnam POWs including Cordine McMurray (right) are gathering in Franklin this weekend for a reunion. Most nights they were locked in stocks where they couldn’t move their arms or feet. “Do you remember feeling the snakes and rats crawling over your feet?” Henry asked and McMurray nodded. “We had to call the guards to come get them off,” Henry said. McMurray shook his head. “That guy had a hard head.” Both men laughed again. They spent six months locked in stocks 24 hours a day. “You just can’t find the words to express it,” Henry finished. “It should have been fought differently,” they said together. Henry has been to the Vietnam Wall. “I didn’t like it. It brought back memories,” he said. Henry had gone there to get a pencil rub of the name, Joe Delong, a guy who was killed during the escape attempt. Henry sent the pencil rub to Delong’s family. McMurray has had several opportunities to visit the Moving Wall, but so far has not done so. “One of these years, I'll have to bite my tongue and force myself to walk that Wall,” he said. I was in Bravo Company, 1st Battalion 12th Infantry, pulling a one year tour I was in a reinforced squad of one officer and 17 enlisted on July 12. We were in an ambush p position waiting for Charlie Company to run the NVA into us. When the North Vietnamese ran into us we knew we were in trouble. We were surrounded and being overrun by part of a regiment! We held them off as long as we could. The rest of of Bravo Company tried to come get us, but they got hit bad in an NVA ambush. Only the company the company Radios operator (Nathan Henry) made it our. I was wounded not seriously but at that point I thought "This is it. I'm going to die." A grenade went off close to me and knocked me senseless just as the NVA came over the hill. When I came to , our machine gunners .45 was pointed at my head. Our platoon sergeant (Mc Murray) was shot to hell, but somehow he lived. Only four of us and Bravo's RTO made it. We were all wounded and captured. I thought they'd interrogate and execute us, but they didn't'. They tied our elbows behind our backs with commo wire and hustled us out of the area. WE crossed into Cambodia and were held in a camp for about 11 or 12 months. On Thanksgiving Day 1967 we decided we were going home, so we tried an escape. I never made it out of camp, but three others did. One was killed; the other two were recaptured. Security got real tight after that. We moved to another camp in Cambodia in the summer of 1968, then began moving north into Laos. A day here, two there. They moved us straight through the DMZ between North and South Vietnam. It was nothing but shell craters and looked like the moon. WE were moving in Russian or Chinese-made trucks when our Air Force dropped a couple of 500-pounders and almost got us. They must have thought we were an NVA supply convoy going north. In North Vietnam we moved four times before ending up at the "Hilton" (the Hanoi Hilton," as the capital city POW compound was called) Our diet consisted of rice, or sometimes these little pea-like things in soup, or bamboo shoots. On rare occasions they'd slaughter a pig or Chichen , and we'd get a little of it. Sometimes we got a little bread. Once, a guard shot a monkey and we got some of that. Mostly, though, we ate pumpkin soup. I'll never forget what it was like in those camps. I was held five years, seven months and 26 days, and was released on March 5, 1973. If you're ever captured, you have to be ready t handle it. read the Code of Conduct, Understand it. Have faith in your fellow prisoners. Believe that your government will come after you some way, some how. Eat whatever your captors give you; you've got to keep your strength up.